Four debates held with then Prime Minister Golda Meir on the day after the Yom Kippur War broke out, on October 7, 1973, reveal the depths of despair. From documents released 37 years after the war, it seems that even the generals received a one-sided picture of the battlefield, and didn’t understand the full significance of the hard blow. During the first meeting, at 9:10 am, those present discussed ways of coping with a war in the international arena – the UN. In Golda's closing comments, she expressed her regrets that Israel had not acted to preempt the Syrian-Egyptian strike, as well as her bitterness about the world's attitude. "If, god forbid, we face such a situation again, we need to ignore the world and let the army get on with it," she said. "We were all of one mind about this yesterday (not to attack preemptively). Yesterday seems like a month ago. (IDF Chief of Staff David "Dado" Elazar) said to me: 'Give me an option.' In the end, and this is important, we get credit only with the Americans. And despite this, (Secretary of State Henry) Kissinger can't recruit another two or three states to call for a ceasefire and a return to the original lines." The debate centered on the question raised by Kissinger whether it would be preferable for Israel if a debate (on a ceasefire) were held in the UN General Assembly, where the "Arabs and their friends" command a majority, or whether he should take the initiative and submit a proposal to the Security Council. It seems that those present were in no hurry to request a ceasefire. Golda wanted to know what was wrong with an extended debate in the General Assembly. "What do we care if there's an assembly?" she said. "It will last a few days. They'll talk… I don't think the Americans will be able to cope with the pressure to compromise in the assembly, just like in the Security Council." Then Deputy Prime Minister Yigal Allon proposed that Kissinger be asked for more time before Israel gave an answer. "A way must be found to tell him about all our fears, and the answer must be: We need more time," Allon said. Minister Israel Galili outlined the reasons why, in his opinion, the request for a ceasefire should be postponed – including an opportunity to push back the Egyptians beyond the Suez Canal. "We must tell him: We don't want the Security Council for two reasons, even if they agree to a ceasefire," Galili said. "We want displacement and strikes. We want time to displace them. We need to tell him the real reason." Then there was a debate over whether to tell Kissinger about the real situation on the Golan Heights, including the evacuation of settlements. Golda was in favor. "I don't oppose telling him, there is also a danger to the settlements," she said. "It all depends to what extent the chief of staff thinks we're ready to tell him the situation will change within 24 hours. I want to give him the real picture. I didn't get the impression that the situation is lost." The last meeting began at 11:50 pm after Yitzhak Rabin, who was a senior Labor Party member without an official position, returned from the southern front with the chief of staff. "The issue of the dead and wounded is complicated," he reported. "There are 400 wounded and 80 dead. (Chief of Southern Command Shmuel "Gorodish" Gonen) thinks that by the time of the attack there'll be 150-200 dead." "The Albert Division has taken heavy losses, though I can't give exact figures," Rabin continued. "Many tanks have got mired in mud – we've lost about 150 tanks. In the Golan, we've lost the same." 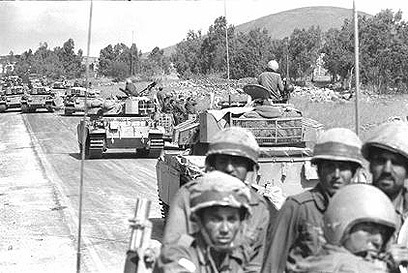 Rabin also related that the Egyptian infantry had crossed the Suez Canal, and that most tank losses were not during battles between armored forces. "Most of our losses are not from tanks but from infantry and anti-tank missiles," he said. "There have been just a few losses in tank battles… It seems a minimum of 350 (Egyptian) tanks have crossed (the Suez). It's probably closer to 500 tanks." 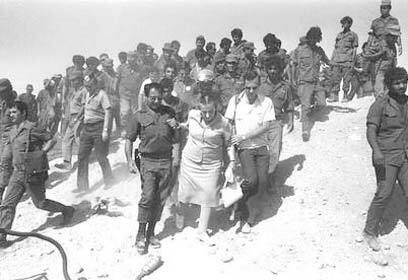 Like then Defense Minister Moshe Dayan during a debate on the same day when he proposed leaving the wounded behind, Rabin too noted the high fighting capabilities of the Egyptian forces. Towards the end of the debate, Rabin outlines the massive attack planned for the following day, based on two armored divisions in the Sinai. "Tomorrow, we must not go bit by bit," he said. "We need a full divisional attack – 200 tanks. (We need to) harm and destroy the tanks, and Dado has approved the two plans, one of (Avraham Eden) Bern and one of Arik (Ariel Sharon). The thinking is that not all 400 tanks will attack. Between Tel Aviv and the Suez Canal these are the only tanks. We'll attack with one division while the other is stopped. (We'll have) serious air assistance. We need to ensure success by detailed planning." Rabin summarized the meeting with words whose significance is spine-tingling: "We have problems. We didn't have a waiting period. Overall, the situation is ok."
During the afternoon of the same day, a debate was held with Golda and aide to the defense minister, Zvi Tzur. The debate centered on the question of military equipment Israel had requested from the US – 40 Phantom aircraft, and in particular, jammers to throw off anti-aircraft missiles whose efficacy neutralized the Israeli air force's capabilities during the first days of the war. "We don't have equipment for every aircraft," Tzur told Golda. "For the Phantoms – one for every two planes, because they fly in pairs. The reason is financial. We asked them for knowledge of the jammers. We asked for this regardless of the war. They're still holding back with the reply." Later, Tzur explains that old jammers had been requested because the new, sophisticated jammers were "too sophisticated." But this had no bearing on the Russian Sam-6 missiles, Tzur asserted: "Against the Sam-6 there are no jammers, even for the Americans, they say." Then Tzur tells the prime minister about tank equipment problems, and that the recruitment had not been immediate and for all. "We don't have enough tank squadrons, and we're regretting it now," he said. "We thought of a gradual increase, but we have no way of recruiting 200,000 people in one day… We have never experienced a situation where we need to get all the tanks down in half a day. We're taking them down slowly. If only we had another three tank squadrons, it would be better." See all talkbacks "2nd day: 'We need time to strike'"